I was born half-Baptist (the East Texas, King James-carrying, pipe organ, hymnalsinging, Southern-type Baptist) and half- Pentecostal (the Holy Ghost, jumpin’ and shoutin’, hand-waving, prophesying, Southerntype Pentecostal). Later, I was born again. I didn’t mean to write and sing songs for a living. Doesn’t seem like much of a thing to get paid for. I’d guess the odds are about the same as winning the lottery or getting struck by lightning. Given my nepotistic hookup, my assumption was that I would move back home after college to sell insurance for my dad and eventually take over the family practice. Who doesn’t love a good actuary table? And yet, one late October night, on an apartment balcony in Waco, Texas, just off of the Baylor University campus where I was student, a friend spun yarns that fell on me like a blanket; and the course of my life was altered. He was an itinerant pastor of a rural church just outside of town. In the year of our Lord, nineteen hundred and ninety-five, we started a church. It was my task to collect sounds and words that would give expression to our communal experience there in Waco, Texas; and a year or so into our endeavor I began to write original compositions, organic things with the stuff of our local soil in them. In the year two thousand, at the dawn of a new millennium, the devastation of Y2K upon us, with great hope, The David Crowder*Band was formed. We recorded six full-length albums reflecting our colloquial journey as a community; and we carried the songs of our journey back and forth, as delicately as we could, across the United States of America and around the world. It was miraculous. To find myself in such exotic locales as Tokyo, Japan, or Omaha, Nebraska, standing on stage, the son of an insurance salesman, discovering that these little songs with Heart-Of-Texas roots had gotten there before I had. It is amazing what The Divine can do with a little tiny thing when you stop pretending and start believing. I was sitting in the front of a tour bus, in the “jump seat,” right next to the driver, watching the white lines of the interstate stop reflecting the light of the headlamps and start reflecting the light of the sunshine. You’d find me there most mornings. 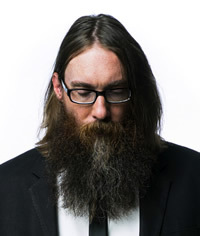 It was the last tour of The David Crowder*Band, and I had no idea what was coming next. I just knew there was a period, a full stop at the end of that sentence. We were topping a hill while the sun was breaking over treetops on a tiny West Virginian coal town. It was cinematic. Quaint. The dominant architectural feature, bathed in sunlight, pointed to the sky determined and defiant, was a steeple. When everything in earth is groaning, “There must be something more,” there is an answer—a monument to the dream of God, a thing unmistakable, sitting in the middle of town. In that moment, topping a hill in rural West Virginia, with new sunshine in the early morning air, I knew I wasn’t done making music; and I knew I wanted whatever I made next to feel like that—a thing pointing up in the middle of all this. Neon Steeple is a collection of songs and sounds looking forward to the past and counting the present as sacred. It is a longing for belonging, a search for home. It is a collection of choruses that believe that this is not all there is. There is more. There must be. It is the sound of the Appalachians and Ibiza. Folk music and EDM. The music of the People. Folktronica. Digital and Analog. The Ones and Zeros and the Handshake. The Banjo and the 808. Neon is an inert noble gas that is obtained from the distillation of liquid air, what we breathe in and out to stay alive, just thicker. You can drown in it. This is metaphor. Neon, a stereotype, a thought that may be adopted about specific types of individuals or certain ways of doing things that may or may not reflect reality. Its utilitarian function is usually selling some product or way of life that distracts a human from the thickness, the weight, the heaviness of the here and now. 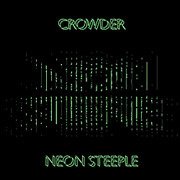 Neon Steeple is both a critique and a hope. The meta-narrative of Scripture is about innocence lost. It is about displacement, about things not being right and a search for belonging and home and forgiveness and reconciliation, the tension of death and life, what it means to be alive. The story is not about making bad people good; it is about making dead people alive. The story sold is rarely that. FOR MORE INFORMATION, VISIT CROWDERMUSIC.COM.